This is a small story in the life of John Muir, environmentalist, creator of the Sierra Club, and the man who was responsible for influencing Theodore Roosevelt to establish the National Park system. 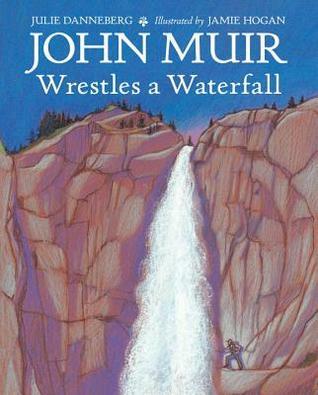 One day, Muir, who lived part of the year in a cabin in Yosemite Valley, climbed the trail up to Yosemite Falls and almost fell of the ledge when he got caught under the rushing water of the falls. He is so close to the waterfall that the mist brushes his face, the noise pounds in his chest, and the night feels alive with the energy of the twisting, misting, roaring water. I'm looking forward to booktalking this book with my 8th graders as it is a great picture book to share with older readers either as a mentor text or just a book to sit down and enjoy on their own. Look forward to this one! Sounds like a great introduction to a great man!